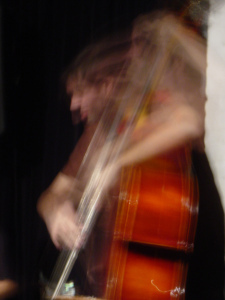 Bassist and composer James Ilgenfritz has worked in New York’s experimental music community for ten years, interacting with visual artists, improvisers, composers, and literary figures. As an improviser James has performed with Anthony Braxton, John Zorn, Elliott Sharp, Anthony Coleman, Jin Hi Kim, Jon Rose, Steve Swell, Nate Wooley, Jeremiah Cymerman, and Brian Chase. As an interpreter of notated music, he has also worked with composers Lukas Ligeti, JG Thirlwell, Annie Gosfield, Pauline Oliveros, Ted Hearne, David T. Little, Karin Rehnqvist, Duane Pitre, Kevin Norton, & Gordon Beeferman. He recently completed a tour of the Midwest and northeast with his jazz quartet MiND GAMeS (with Denman Maroney, Andrew Drury, Angelika Niescier). His debut solo recording ‘Compositions (Braxton) 2011’ features his distinctive solo bass interpretations of the music of Anthony Braxton, and was called “a considerable achievement of solo instrumentalism and an important demonstration of the possibilities open to the double bass in the early 21st century” by Avant Music News’s Dan Barbiero. Current projects include his longstanding Anagram Ensemble (which has morphed from jazz quartet to experimental big band to avant-garde theatrical chamber ensemble), Hypercolor (with Lukas Ligeti and Eyal Maoz), Red Triangle (with Chuck Bettis and Nonoko Yoshida), COLONIC YOUTH (with Dan Blake, Philip White, and Kevin Shea), The Curators (with Joe Hertenstein and Mikko Innanen) and Radiant Tongues (with Jason Ponce). In 2011 James was Artist In Residence at Issue Project Room, where he premiered his opera The Ticket That Exploded (based on the 1962 William S. Burroughs novel of the same name). He is coordinator of the WSB100 festival, New York City’s month-long celebration of the life and legacy of William S. Burroughs on the occasion of his 100th birthday. James Ilgenfritz holds degrees from University of Michigan & University of California San Diego, and is on faculty at Brooklyn College Preparatory Center & Brooklyn Conservatory.